Inbuilt post, famous post, social share,and follow symbol, menu bar, direct custom contact frame, and responsive drop down menu, responsive comments box with responsive draft outline. search engine optimization, AdSense support, pattern-coded, easy-to-use gadgets Minima Colored mag style Responsive ,News to Journal style, suitable for blogs, online magazines website look, photo exhibit blogs, video display your website, movie website, personal blogs and more like all websites. Hope you like this awesome Feature . 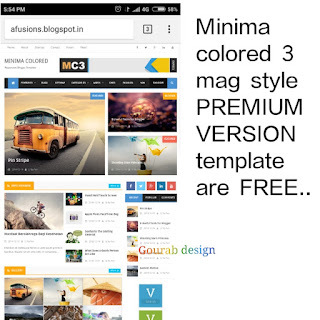 I will shared this Latest theme are FREE.So download and enjoy.